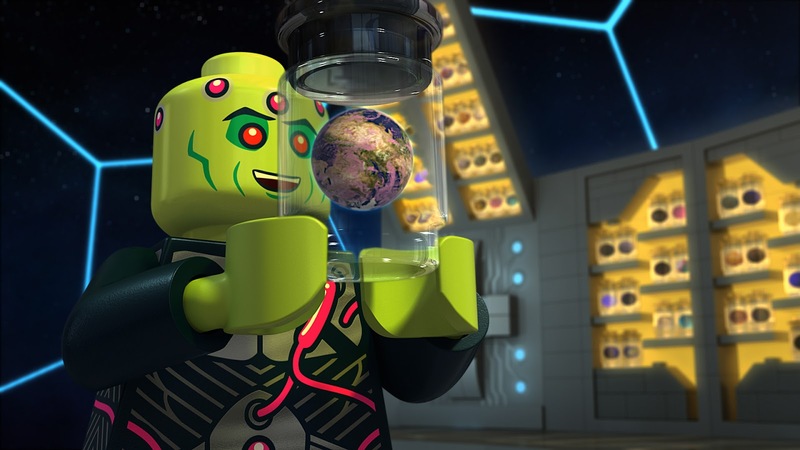 Super-genius super-computer and compulsive Collector of Worlds aka Brainiac 1.1 has his sights set on our Earth but the Justice League is there to stop him! 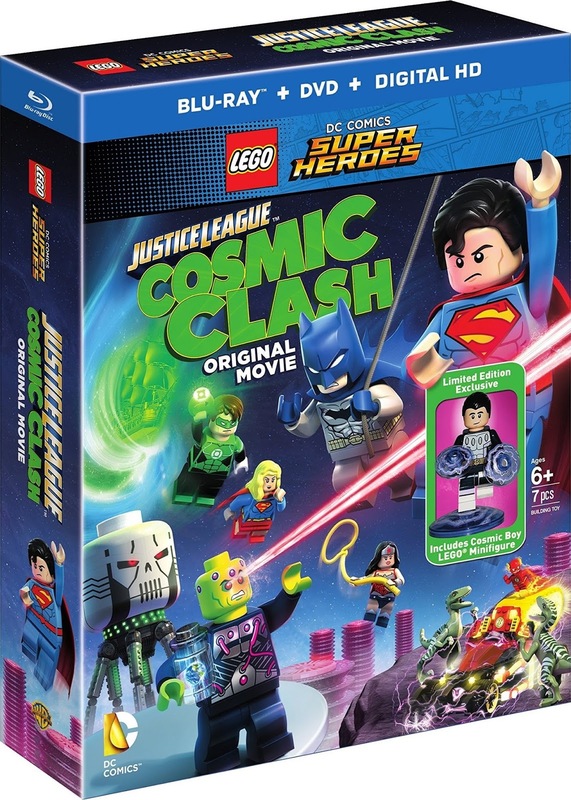 LEGO Justice League – Cosmic Clash is the fifth film in the LEGO DC Comics Super Heroes direct-to-video series. Superman, Batman, Wonder Woman, The Flash, Cyborg and Hal Jordan Green Lantern protect the Earth from being shrunken to Kandor size but not without some help and a bit of timey-wimey adventures. Digging into the lore of DC Comics Silver Age and recent history, this Lego movie is one for Superman and Batman fans of any age. The movie opens at the Hall of Justice where everyone except Batman is playing a trust game of hide and seek. Batman (Troy Baker) refuses to play because he’s sort of a wet blanket and refused to think of his Justice League co-workers as anything other than associates. Younger teammates The Flash (James Arnold Taylor) and Cyborg (Khary Payton) take the opposite view and embrace friendship! 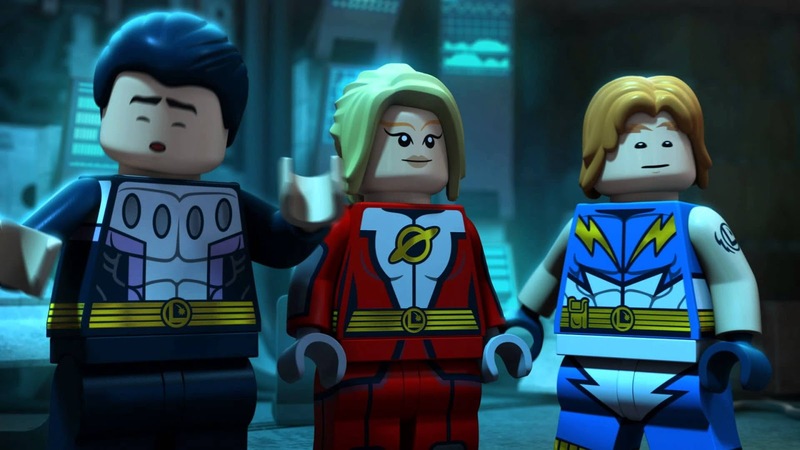 Led by Blue Boy Scout Superman (Nolan North) and the ultra confident Wonder Woman (Grey Griffin) and Green Lantern (Josh Keaton), the League takes to the sky when the Klaxon alarm warns of a threat to Earth! Using teamwork, they are able to send Brainiac (Phil LaMarr) back to where he came from and damage his shrink ray, but when he returns he zaps Superman, Green Lantern and Wonder Woman into three different time periods and it is up to the rest of the League to save them and to keep Brainiac from taking over the world! In a time traveler’s plot-line not dissimilar from Grant Morrison’s 2010 Batman: The Return of Bruce Wayne, Bruce and Barry build a Cosmic Treadmill in the Batcave (this is a Lego movie after all) to travel back in time to where Diana is trapped, the age of cavemen! One of the many threats they face there are Vandal Savage and a Wonder Woman who forgot who she was! 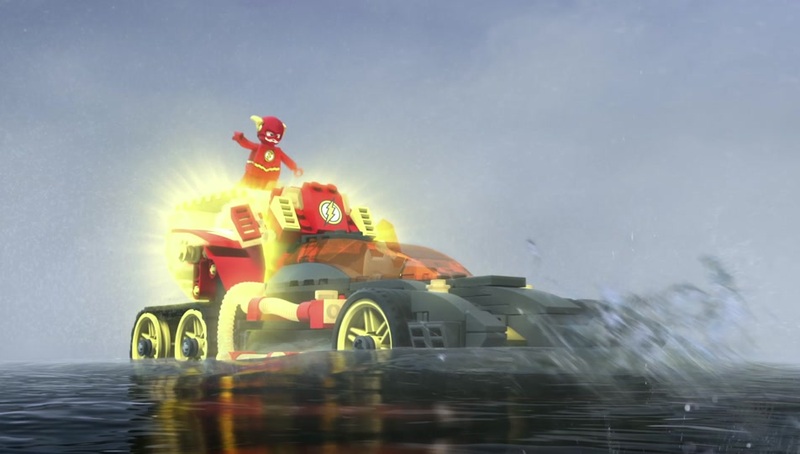 Flash wonders why Batman keeps a caveman version of his cowl in his Batmobile, but of course the only answer is that Lego Batman is prepared for any scenario he may face. Green Lantern is stuck in the age of pirates — we all know how popular pirate ships are to builders as well! Batman dressed as Batbeard and the Flash are able to save Hal from swabbing the decks but more importantly save them all from listening to the stranded surfer dude LEGO stowed away on the ship. In order to save Superman, Batman must travel to the future where the city has been renamed Brainiactropolis and Brainiac is already controlling everything, including Clark! Superman is half Brainiac and it takes a Batman and the tools of dusty and forgotten to take him down. It’s almost as if there were a Batman v. Superman movie coming out this month to prod them to put these two against each other! Batman doesn’t do this all by his lonesome self, however. Back in our timeline, Cyborg enlists the help of Supergirl (Jessica DiCicco) and Batman gets a boost from DC’s original Legends of Tomorrow, the Legion of Superheroes! Cosmic Boy, Lightning Lad and Saturn Girl are there to lend a hand and give Batman what he needs to go after the Rogue Superman. Along with Batman referencing cult tv show The Prisoner‘s opening “I will not be pushed, filed, stamped, indexed, briefed, debriefed, or numbered,” to silly fun LEGO universe rules and a very silly but enjoyable ending of the film, I recommend this one! It taps the deep history of the DC Universe (something the company itself seems to be embracing more nowadays) while remaining funny and good for the kids to watch. 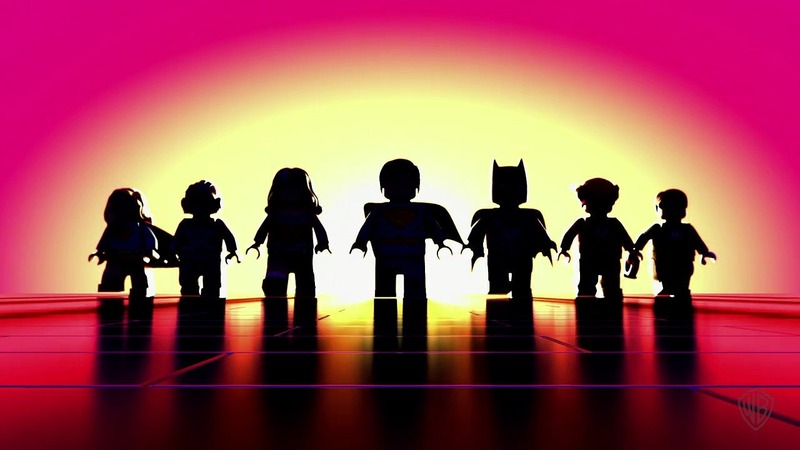 Fans of LEGO and deep cut DC Comics Easter Eggs and Back to the Future jokes will enjoy this LEGO Movie starring the Justice League! I’m lucky enough to be both of those people! Though, can you imagine if we actually are being kept in a bottle in mint condition on some collector’s shelf right now? I just hope we don’t run out of air if that is the case!